A controversial trip to the south of France leads the Belfast Telegraph. The paper reports that six councils in Northern Ireland spent £120,000 on sending officials to a property conference in Cannes in March. It was the fourth year Belfast was represented at MIPIM and this year members from five other NI councils also jetted off to the French Riviera. Belfast's 100-member delegation accounted for £80,000 of the total spend. The Taxpayers' Alliance branded the trip a "jolly" and said such trips must be "cut back or justified". However, the councils were robust in their defence of the decision to attend. SDLP councillor Donal Lyons said it was money well spent. He said that as it was the prime event in the European real estate calendar it was "essential that we take the opportunity to showcase the opportunities our city presents for investors". 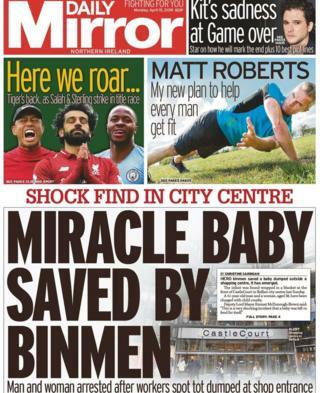 The Daily Mirror reports on a "miracle baby" found outside Castlecourt in the early hours of Sunday morning. Wrapped in a blue blanket, the baby was found by bin men outside the shopping centre in Belfast. An ambulance was called and the one-month-old was treated at the scene. A man and woman were charged with child cruelty. The pair appeared at Belfast Magistrates' Court on Tuesday and were released on bail, the paper reports. In the News Letter a light is being shone on a publicly-funded company's marketing money. The paper reports that the System Operator for Northern Ireland (SONI), which runs NI's electricity grid has refused to say how much it spends on marketing. "The highly unusual situation means that electricity consumers in NI - whose bills are already among the highest in Europe - are paying for SONI to advertise itself to them," writes Sam McBride. Furthermore he explains that this happens despite the fact that SONI has "no product to sell and no one has any choice whether to use them". SONI did not answer a question from the paper as to how much it had spent on marketing and sponsorship over the past year and why. In a statement a spokesperson said SONI's spending was approved by the utility regulator which it said "ensures that the services we provide are value for money for electricity consumers". "Was my daughter murdered?" - The stark headline stares out from The Irish News. The paper reports that the father of a Belfast woman found dead in her flat wants answers. Bridget McKay, 30, was reported missing two days before her body was found in the New Lodge. Her father Edward says her body has not yet been released to the family and claims that no-one had been to speak to them or give them information about what had happened to her. "I would like to know exactly what happened," he explains. "Do they suspect foul play or murder? Why are the cops holding the body?" he asks. The PSNI said post-mortem examination results were inconclusive and officers were awaiting toxicology results. Often misspelled as its flashy namesake in LA, Holywood, County Down is basking in celebrity of its own. The News Letter reports that the town has made it to the Sunday Times 2019 list of most desirable places to live in the UK. Described as the "ultimate location for the best of both worlds," the home of golf legend Rory McIlroy won because of its proximity to Belfast and beautiful scenery. Calum Best beams with pride in the Belfast Telegraph. The son of one of Northern Ireland's most celebrated footballers put on a charity football match to raise money for young people affected by alcoholism. His father, former Northern Ireland and Manchester United player George Best, died in 2005. Celebrities including Danny Dyer, Jake Wood and Love Island stars turned up to play in the match. About 6,000 fans turned out to cheer on the celebs. "To be at Windsor Park and see my old man's picture on the wall is something special," Best tells the paper.